At other oval tracks, the stands are all on the outside of the oval. 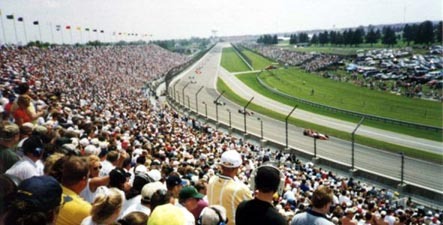 At Indianapolis, there are many stands on the inside as well. There are also grassy hills where people can watch the race as well. While most of the stands are simply normal bench seats, Stand B features folding chairs. Also the Penthouse (upper level in Stands E,A,and Paddock) have backs to the benches as does the Paddock sections, but not the paddock boxes. Also the Tower Terrace features backs on their aluminum benches. There is no place you can sit and see the entire track. Generally the best you can do is see half by sitting in the outside of a corner. There are no BEST seats and no BAD seats. Different areas offer different benefits. You may wish to see the pits, the front straight, the finish line, the winner's circle or the first turn. You may want to party in the infield or sit near certain food stands or close to your special parking area. I just just consider myself lucky to be there anywhere. Generally, you want your seats as high as you can get them for the best view. If you are sitting realy low in some locations, the wall may obstruct your view of the cars as they go by. When you sit high, you can see over the fence in some situations. Note however that higher seats in stands that have an upper deck (penthouse) will have obstructions scattered about such as support beams. Your view can also be blocked by sitting in the top few rows of these stands by the roof and by camera "cages" that hang down, Especially in popular Stand E.
Here are some photos taken from 2004 when I was in 2nd row from the top of Stand E.
Stands that have upper decks include most of Stand E, Stand B, Stand A and the Paddock. Another concern of top row in these areas is a rainy windy day - those people below you are protected, but you may be getting wet. Wind in Indy typically drives from the SW toward the NE and Stand E is directly in its path. Some stands that do not have a penthouse level, do have a "deck" which is 2 rows of bleachers that are a few feet above the top of the stands. They are as expensive as sitting in the penthouse. They are great seats. Sitting in the top row or two also can present a blessing or a curse depending upon the weather. If its hot out, you can get a nice breeze. If its a cold day, you may be chilled by that same wind. One of the nicest things about getting top row is that you can stand up and lean against the fence through the whole race without blocking anyone's view! I like sitting in the outside corners because these seats provide the widest view of the track. It is possible to see the end of a straightaway, 2 corners, the shortchute and an entire straightaway. While Stand E in turn one is the most popular corner to sit in, there is a problem there where the afformentioned beams in Stand E will likely block part of your view. This applies to the penthouse level as well. There are no roofs or beams blocking your view in the other three corners. When sitting along a straightaway, you have two obstacles. Firstly, the fence post blend into a wall as you look down the stretch. Secondly, many people tend to lean forward which causes everyone else to have to lean forward to get a view. This is uncomfortable, at least to me. If everyone would just sit back and take it easy, then everyone could see. Obviously when a crash or something happens, everyone is going to be leaning forward and standing up to try and see. Most people enjoy seeing the pit action as well as all the festivities that center around the finish line. That is one of the drawbacks about sitting in a corner. You are going to get your best views of this by sitting in the Tower Terrace, Pit Road Terrace, Paddock or Stand A. It is a big climb to the Penthouses. There are these open stairwells on the outside of the stands that you must climb to reach any of the Penthouses. It is kind of scary if you're uncomfortable with heights. Some people refuse to climb them. It can also be a workout if you've been carrying heavy coolers for miles. If you are blind, feeble, have weak knees or heart trouble, I suggest not buying Penthouse seats. Infact I would say that if there is any chance of you having a medical problem, that you do not sit up there as I would imagine that it would be tricky getting you down to the ground and to an ambulance. Many suites are up high and they have elevators! You have to be invited to get into those though or rent one for tens of thousands of dollars. There are suites all along the top of the Tower Terrace, the top of the F1 garages and atop Stand C. There are suites in the pagoda tower. There are also party suites in the Tower pavilion and behind the F1 garages. Sitting at the exit of a corner, especially turns 2 & 4, the cars are moving at their slowest. Sitting down at the end of one of the straights, the cars are moving their fastest. Many people want to see any crashes that occur. Crashes usually occurr in the turns. It seems each year that there is one particular corner where crashes occur most often. This changes each year. Watching throughout the month of May and seeing where the practice crashes are occurring, is the best indicator of where trouble will be on race day. There are some good and bad spots in the Tower Terrace. If you sit up high in Sections 37-40, the tower will block your view of the south half of the main straight. If you sit at the far end of the Tower terrace, Section 79, seat 10, you will have an unobstructed view of the north end of the track as well a a good view of the main straight. If you sit in the top row, you can see the infield behind the tower terrace. Another good thing is that the tower terrace has backs to the aluminum bleachers. If you sit on the outside of the track down the main straightaway and into the first turn, you may have a roof over your head. This has two benefits. The first is it protects you from sudden down pours or a boiling sun. The other reason is that these bleachers are metal and it creates an especially cool echo effect from the roar of the engines that vibrate the seats and adds to your enjoyment of the race. However, higher seats may have beams obstructing portions of your view as mentioned above. There are huge TV screens at various location around the inside of the track. Generally they are viewable from most seats, but getting a good view of them is still a consideration. It is about impossible to hear what is going on over the P.A. system during the race, so the TV's help a lot. There is a wheelchair accessible stand located inside the short chute turn 2. See 2nd map at top of page. There are also areas along the base of the North Vista, Northeast Vista and Paddock area that are wheelchair accessible. There is a maximum of 2 companion seats for each wheelchair space. Handicap parking is also available. Click Here for more information. 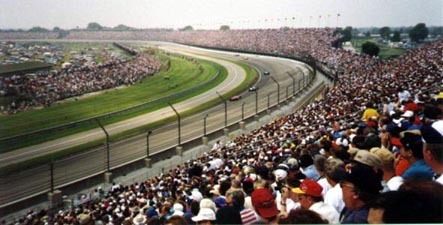 There is no general admission seats on race day for the NASCAR Brickyard 400. 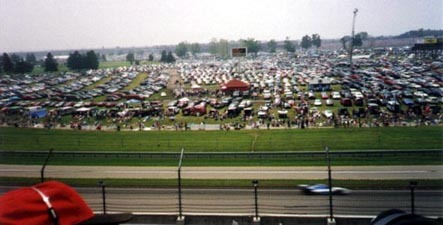 General Admission for the Indy 500 - There are grassy viewing hills all along the back straight and third turn. See Photos of Turn 3 Infield. Hills to the south (by Turn 2) are alcohol free, intended for families and people who might be offended by the partying that goes on in the Turn 3 infield on Race Day. There are also viewing hills in Turn 1. See map at top of page, the green shows where the hills are. Indy 500 general admission costs only $20 at the gate - CASH ONLY. Note: You may notice a lot of people sitting in the Turn 4 infield. This area is not open to the general public, but is used by families and friends of people in the pre-race festivities. General Admission for the U.S. Grand Prix - There are grassy viewing hills along the east side of the infield track. There are also hills beside turns 8-10. See map at top of page, the green shows where the hills are. Tickets are $60 and should be ordered in advance. These tickets are also good for Friday and Saturday. Race day only general admission is not available. Sitting inside the oval has its good points. It is easier to access all the amenities inside such as Gasoline Alley, the Museum, and entertainment stages. There are always things to see in tents in the plaza east of the Museum as well. You can save some walking by taking the trams that run around the infield. They pick up people who park in the 3rd turn and run up the middle of the infield and over toward the Tower, and then up to the museum where they turn around. They also run outside the track to the North 40 parking. Many of the stands that line the outside of the track are generally closed during practice days in May. 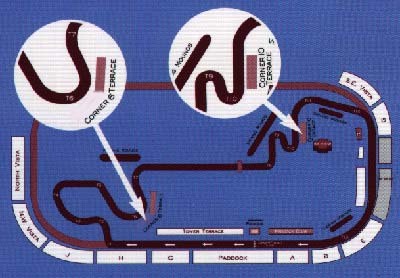 Many of the items mentioned above in regard to the outer oval, apply to the U.S. Grand Prix. In addition, sitting in Stand H or beginning sections of Stand J, provided a good view of the cars moving from the long fast straight and into the infield road course. I like section 12-13 of Stand H as it provides a close view of Turn 6 too. Sitting far away in the NW Vista (preferably in sections 1-12) you probably get the biggest view of track - seeing the front straight, along with turns 1-7, but you are the furthest away from the track. (see photo at bottom of page.) Another excellent area to sit is in a small area of the huge Tower Terrace. If you can get a seat at the far north of this area (section 79, seat 10), then you can see the main straight as well as turns 1-6 by looking over to your right. And if you happen to get top row, then you can see the back straight behind you. Sitting in the SE Vista provides a wide view of the track too. You'll see the cars coming out the infield and back on to the oval track and toward the last turn. This is a great spot to be for the pre-race show. The cars are brought out to the grid right in front of you and you get to see the drivers get ready. Seeing the cars streak off from a dead stop is unique. You get to see all the pit stops. After you see the finish, you get to see the awards ceremony, albeit from a good distance. The problem with this area, and with the tower terrace, is that it is hard to follow the race as your view is not wide. Of course there are huge television monitors scattered about to help you. I might also mention that it is louder here in the "canyon". Sitting in the last turn (13) in Stand E provides a nice view of the short chute and the front straight. However, you will only see the cars flat out, no braking. There are stands that are erected in the infield for just the F1 Grand Prix. they are the Corner Six Terrace and the Corner Ten Terrace. I think the seating in these bleachers is too cramped. There is no television monitor to watch from these stands either so it is hard to follow the race. Portalets and refreshment stands are setup behind these two stands. Corner Ten Terrace provides a better view of two turns, but Corner Six allows you to see the cars, albeit far away, zipping down the front straight toward turn 1 if you look left. Of course you can also see turn 6 right in front of you. Parts of the viewing hill are good. I like to see the cars accelerate down the back straight as the come out of turn 7. You have to get there early to get a good seat. The sharp curves slow them down quite a bit at the end and also caused some spins. Make sure and bring one of those collapsable lawn chairs. Looking Right.. 3rd turn, short chute, 4th turn.